We are thrilled to unveil Zoho Docs for Desktop, the service that syncs your files to the cloud, makes them incredibly easy to share with anyone you want and lets you access your documents anywhere you are. Syncing files between Zoho Docs and your desktop is fast and easy. If you have multiple computers, your files will be replicated across all of them, in addition to living in Zoho Docs. They are always available wherever you are. Plus, syncing requires no effort from your side – just set it up and forget it. Zoho Docs for Desktop is a great way for you to always have your most important documents backed up. Zoho Docs for Desktop extends the boundaries of collaboration by letting you easily share files -even large ones- with anyone inside or outside your company. When you share a file with someone, they can access it with just their web browser or, if they install Zoho Docs for Desktop, they will always have the latest version of the shared files available in their computer. With Zoho Docs selective sync, you can choose to sync only the most important or recent project folders you need while on the go. Each one of your computers can have a different set of folders synced based on your priorities. This is great for our users who own laptop with flash drives that while lighter and faster, provide less storage. No WiFi On Your Plane? Work Offline! While you’re on the plane, you can still edit, create and delete files in your Zoho Docs folder in your computer. They will automatically sync to the cloud when you go online. You still need to stay connected to access documents created using the Zoho Docs online editors, but you can easily get to them from your desktop folder. We have introduced new pricing plans for Zoho Docs. Our free plan, with 5 GB of storage space and unlimited users, means that you will now be able to manage as many users as you want without paying a buck! If you are looking for more storage space, you can upgrade your account with a monthly or yearly subscription to plans that offer up to 250 GB and even 1000 GB of storage (that’s 1 TB). 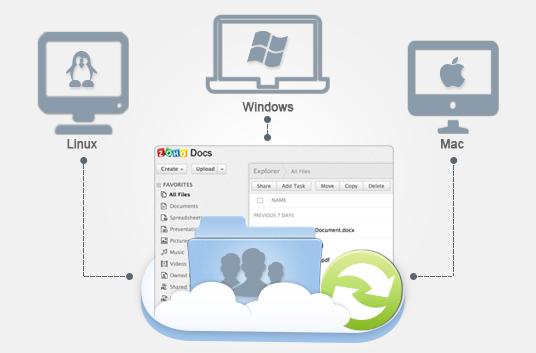 Zoho Docs for Desktop can be installed on Windows, Mac and Ubuntu Linux. We are hosting a webinar on Wednesday, September 25, 2013 at 9:00 a.m. PDT. Register here for Zoho Docs webinar. Before I wrap-up, just wanted to give you a heads up that Zoho Docs online editors got a complete makeover with a much cleaner user interface that our users have already fallen in love with. So, what are you waiting for? Try Zoho Docs now and do share your experience with us, while we continue working on the enhancements. I’ve had issues with it not syncing for months now and despite Zoho’s best efforts to date, it’s still not working. Anyone else having similar issues? @Ivan & JodyWe are sorry to know about your trouble with Zoho Docs Sync installation.Please note that Zoho Docs Sync is available only to the Paid and the 15-Day Trial users, not to the Free users.If you are in the Free version of Zoho Docs, please upgrade your subscription to the paid version, or you can try our 15-Day Trial version.To know your current Zoho Docs subscription plan, you can click on the settings button at the top right corner, and select “Subscriptions” from the dropdown. Or, you can directly visit https://docs.zoho.com/showplan.do. From the subscription page, you can upgrade to the paid version, or go for the 15-Day Trial. Afterwards, you will be able to install Zoho Docs Sync successfully.If you are still having trouble installing Zoho Docs Sync, please let us know the email address of the Zoho account using which you are trying to install Zoho Docs Sync. So, we will be able to analyze it in a better way on our end and assist you further asap.You can send the details to our support email address support@zohodocs.com. We will look into it and get back to you asap.Thank you for your understanding. telling me that I don’t have sufficient privileges to use Zoho Docs. When I try to login with the desktop client I get an error message telling me that I don’t have sufficient privileges to use Zoho Docs. Does yesterday’s writeup seem better than today’s version? Zoho Docs to the rescue.